Impoverished and wild – this describes the region between Apulien, the Bay of Tarent and the Tyrrhenian Sea. Rarely visited by tourists, it is among the most sparsely populated regions in Europe. This is partly due to the low rainfall. While the mountains along the western coast receive 2000 millimeters of rainfall per year, the conditions around Matera in the East are desert-like. Those unperturbed by the region's barrenness can discover a host of exciting things here. Mountain village where time has stood still. 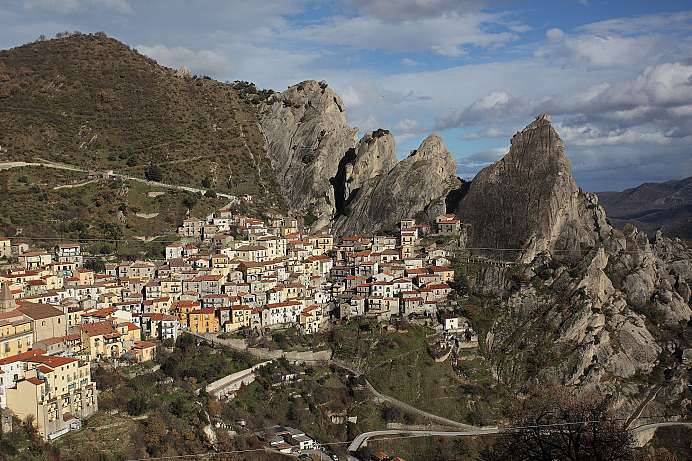 On the western edge of the Parco Gallipolli Cognato lies Castelmezzano, a mountain village, which is huddled against the imposing cliffs and where time seems to have come to a stand still. In the 6th and 5th century BC, Greek colonists founded the city of Maudoron. When the Saracens raided and plundered the coastal town 1500 years later, the displaced residents settled on the rock and formed todays Castelmezzano around 1,000 AD. This medieval town is so striking that several movies have been filmed here. 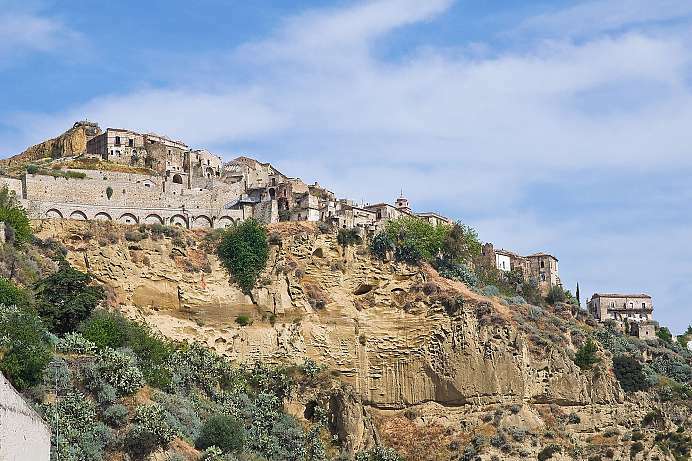 Craco stands in the moonscape of southern Basilikata. In 1991, landslides swept half of the town down into the valley. Afterwards, the World Monuments Fund added it to its list of endangered cultural monuments. Very few people live here nowadays. 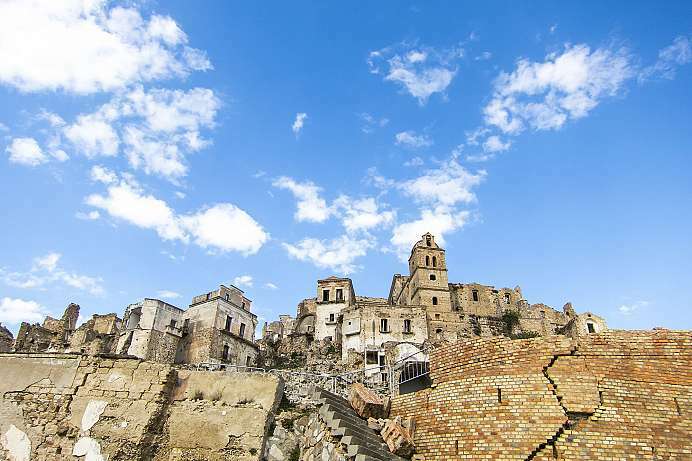 Located in the southern region of Basilicata, Matera is the most outstanding example of an intact troglodyte settlement in the Mediterranean region and has been declared a World Heritage Site by UNESCO. The city has over 100 rock churches, a testimony to the Greek-Byzantine monastic civilizations that once ruled the region. It is the city of art and folklore, and is considered one of the most ancient continuously inhabited settlements in the world, dating as far back as the Palaeolithic period. 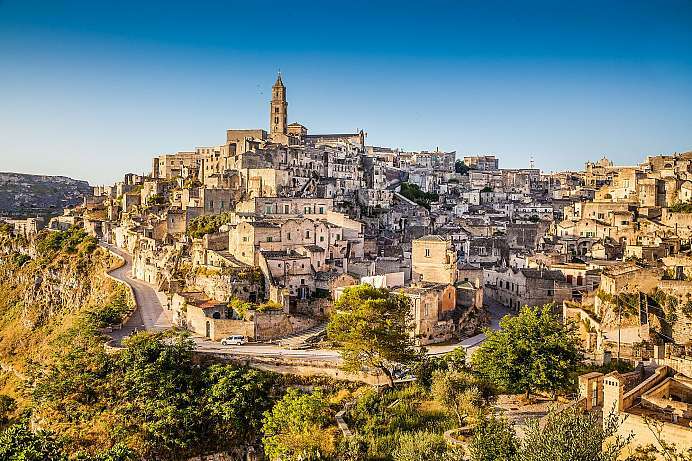 In addition, Matera is located near the beaches along the Ionian coast and the archaeological sites of Metaponto and Policoro. The Pantano Woods, an area protected by the WWF, is close by as well. Excursions can also be taken to the Melfi and Venosa castles near Potenza, to Pollino National Park, or to Murgia Materana Park. The location offers many opportunities to enjoy beautiful landscapes and become acquainted with the culture and folklore of the region. 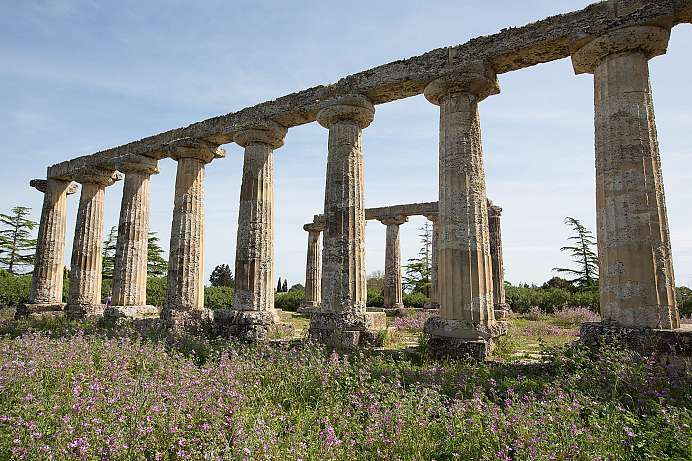 From the eighth century BC, the overpopulated Greek cities began to establish colonies in southern Italy and Sicily. The new Greek settlements were called Magna Graecia (Greater Greece). One such Greek colony was Metapont in the Gulf of Taranto. According to legend, it should be founded by the builder of the Trojan Horse. There are only ruins left of the ancient Metapont. In the Museo Archeologico Nazionale di Metaponto you can visit the finds from the time of Magna Graecia. The city's most famous citizen was the philosopher and mathematician Pythagoras, who lived in Metapont in the 4th century BC. The old town of Tursi is particularly intriguing due to its location on the vertical escarpment that once protected it during the Middle Ages. In fact, the history of the town began when residents from the neighboring town of Anglona sought refuge here from the pillaging Goths during the Migration Period. The Saracens later turned Tursi into a stronghold, which they called Rabatana, but then had to surrender to the Byzantines in around 900 AD. Tursi does not seem to have changed much since then. The towns of Pietrapertoa and Castelmezzano are among the most beautiful mountain villages in the Lucan Dolomites. Perched beneath massive cliffs on opposite sides of a valley, the towns are connected by two cables spanning hundreds of meters. These zip lines and allow you to soar over the valley like an eagle, combining a perfectly safe thrill with views of the rugged, impassable valley below. 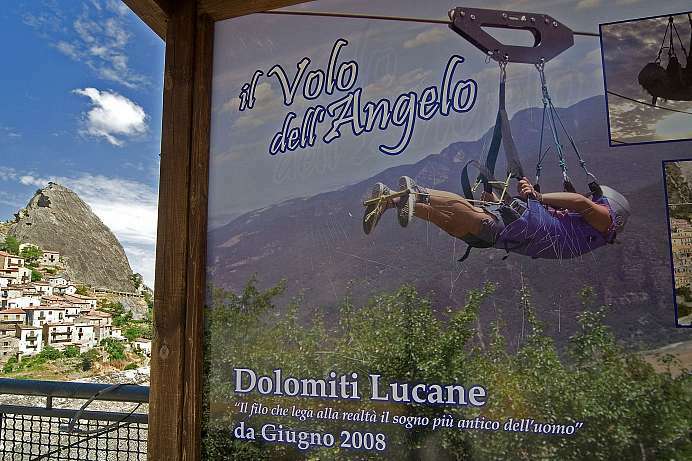 The zip line ride from Pietrapertosa to Castelmezzano covers a distance of 1,415 meters at speeds of up to 110 km/h. The return trip on the second cable is even more exciting. This so-called “Flight of the Angel” is a great addition to any tour of the Dolomites.